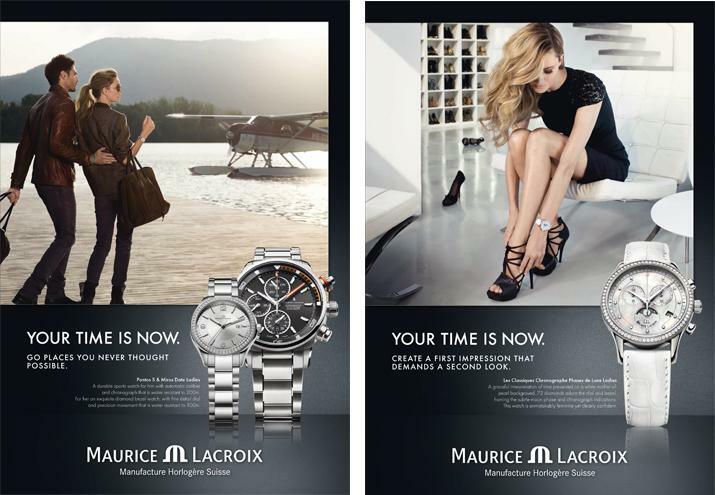 Maurice Lacroix is set to launch a new global advertising campaign under the tagline “Your Time Is Now” aimed squarely at a young upwardly mobile target audience with plenty of disposable income. The campaign will run worldwide using imagery and taglines that reinforce key consumer insights of self-reward, recognition, of success and pride. The idea being to spoil yourself, go new places and enjoy the high life as you are only young once. The campaign comprises 3 visuals promoting men’s and women’s watches as well as combinations for him and her portraying a series of aspirational scenarios reflecting the Swiss dream; an affluent, self contained almost celebrity lifestyle. With this campaign, Maurice Lacroix wants to communicate the craftsmanship, creativity and confidence that characterise the brand and its products. Since the launch of its first watch in 1975, Maurice Lacroix has evolved to become a sought-after Manufacture brand. At the end of 2006, Maurice Lacroix set up its own workshops to produce the complex components for its outstanding mechanical calibers. This development has catapulted the brand into the exclusive league of Swiss Watch Manufactures. Thanks to its numerous innovations in both technology and design, Maurice Lacroix rapidly filed a number of patents and trademarks. Maurice Lacroix is one of the world’s few independent watch manufacturers and employs over 200 people worldwide, the majority of whom are based at the international head office in Biel and in the manufacturing plants in Saignelégier and Montfaucon in Switzerland.